Hobie Forums • View topic - Cradles for Compass? Post subject: Cradles for Compass? Which, if any, of the Hobie cradles (for PA, Outback etc) will fit and is appropriate for the Compass hull ? And is it OK to store on proper fitting cradles in a garage (also to use on a trailer) ? I would prefer to store right side up if possible and looking for options (other than PVC pipes). Hobie - if your existing line of cradles don’t work for the Compass, will you be introducing one for the boat? Post subject: Re: Cradles for Compass? This is a great question, was hoping to see an answer. 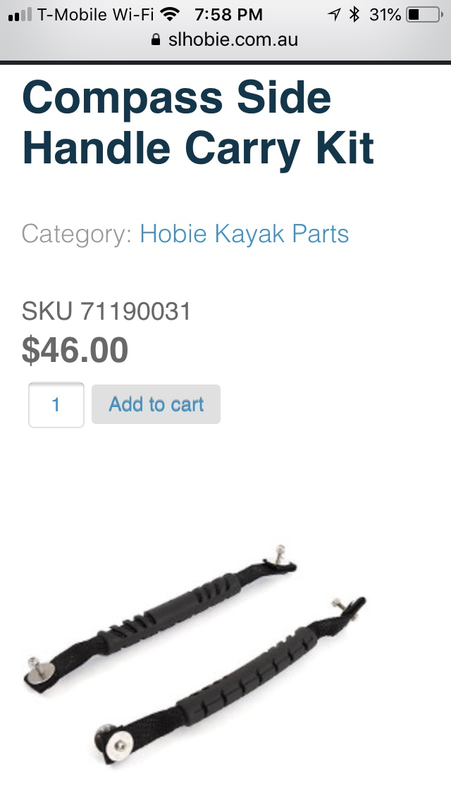 I am having second thoughts regarding my decision to buy the Hobie Compass two weeks ago. I had the Compass on the water once and loved the way it handled. 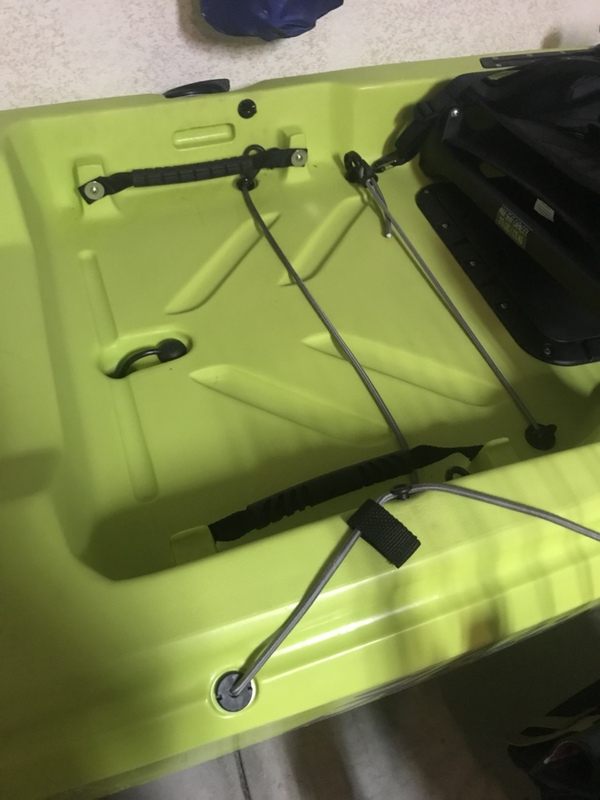 My problem is getting it on and off my suv due to (1) the rudder hinders loading (2) Hobie does not have a cradle for the Compass and apparently states that the hull will distort if the yak is not placed upside down on cross bars. So far I have purchased a Malone load assist system and cannot use it because I have to lift the Compass about 3 feet in order to set it in the cradles. This process is complicated because it is difficult to wrap you arms around the midsection of the kayak and then lift it 3 feet. Other than spending a few hundred dollars for another lift assist system, what options do I have? I think you need a sturdy handle at about the balance point or two handles equi-distant from the balance point in order to lift it up the 3 feet. I had two handles mounted under the seat by the dealer (on each side). Problem is that if you lift on them the kayak is bow doesn't lift because they're behind the balance point. I may add another a bit forward so i can lift mine onto my hullavator easily. Your approach makes a lot of sense. I will add handles in a manner that will deal with the balance issue. With the yak on its side, would you place the two handles on the lower side? (with the top side of the yak facing you). I hope that made sense. would love to know where to put those handles, Ive seen pictures of on the inside of the kayak right under the molded handles by the seat, but not sure how it worked out for the owner, on a side note malone came out with a new lift assist where the bars go down to the ground, so you dont need to lift at all. I have same question. Is Hobie responding on Compass cradles? Could other cradles be used? Maybe I could create own cradle by modifying some solid form blocks? You would think if cradles exist they can be used to transport and also store them? I really would like to extend my on the water time by avoiding the rigging install and tear down every time I hit the water. The under seat handles are a hobie part made specifically for the Compass. They work pretty well, a lot better than the molded in ones. I transport with a hullavator. Works great! Do you have a photo and part number? Love to see how they are installed. Compass cradles are still in tooling process. 2019 model year changes have been taking priority in the factory, so... hopefully we will see them soon.